London's commuter belt has seen a spike in the number of homes left long-term empty despite a downward trend across the UK since 2010. Fourteen of 20 local authorities that saw the largest percentage increases in vacant homes from 2015 to 2016 are in the South East, analysis shows. "Buy-to-leave" investors were active in those areas, experts said. The government gave councils new powers to charge a 100% council tax premium on empty homes in Wednesday's budget. From 2010 to 2016, the number of long-term empty homes - defined as unfurnished and unoccupied for more than six months - fell from around 300,000 to 200,000. However, analysing official data from the Department for Communities and Local Government, the BBC's Shared Data Unit found wide regional variations. Jeremy Leaf, north London estate agent and a former Royal Institution of Chartered Surveyors residential chairman, said there was evidence of the "buy-to-leave" phenomenon in the commuter belt. This sees investors leave property empty while the land's value increases. He said: "Buy-to-leave generates considerable negative publicity, but it constitutes a relatively small part of our 'broken' housing market. "It is often forgotten that many of the foreign investors in the firing line for leaving these homes empty are the very people helping to finance developments, which include many affordable units and which may not otherwise be built." Property agent Henry Pryor said: "For those investors who are only interested in capital appreciation, rather than rental yield, the South East is all the more attractive." "The only place where it makes sense is where there is rapidly-increasing land value and that's happening more than anywhere else in London and the South East because the sheer amount of demand is outstripping supply," said Dave Smith, of the National Housing Federation. In 2016 one in 10 English councils had recorded the highest number of long-term empty properties per square kilometre for five years. Since April 2013 English councils have had powers to charge an extra 50% council tax premium for homes that have been empty for two years or longer. The November 2017 Budget allowed councils to double council tax on empty homes. Helen Williams, from the Empty Homes charity, said the announcement "recognised the importance of taking action, however it is unlikely to be a sufficient enough deterrent for some wealthy investor buyers". She said: "A more thorough review of what would stop people from buying properties to leave empty, or hardly ever used, is needed. "The announcement also did not address the blight of the high level of empty homes in lower house price neighbourhoods, often linked to the poor standard of housing in those places." Mr Pryor said: "Most wealthy individuals able to have the luxury of keeping these homes will see the extra premium as the cost of doing business in the UK, not really a tax. For them it's pocket change." "Housing in this country has become a commodity and an investment rather than a basic necessity. Where we have landlords incentivised to provide housing [like housing associations] we have lower rates of empty homes and we can chip away at this phenomenon," said Mr Smith. "We bought our house for £1"
Councils in Stoke-on-Trent and in Liverpool have sold former property for £1. Nurses Sam and Rachael Kamau had previously not been able to buy their own property before they qualified for Liverpool's scheme, under which they have promised not to sell for five years. 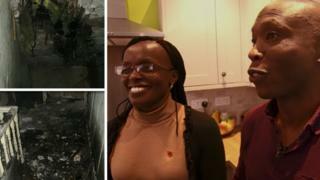 Mother-of-two Mrs Kamau said: "We'd been renting for a long, long time and we didn't have a clue about how to restore a house. The journey has been a real rollercoaster. It's been very tiring because we both work and we came every single day since we got the keys. "Even by March, we could only walk in the middle of the hallway because there were no floorboards but when that was done and the new windows went in we felt like we'd turned the corner. Then it started to feel like a house. Not yet a home, but a house and that was a big moment." Harrow Council said it had seen a sharp rise in new developments and the jump in six-month empty homes was due to the lag between these new properties being completed and being occupied. Watford Borough Council said vacant homes made up 1.5% of all the homes in the area due to its "buoyant housing market". A regeneration project in Tamworth saw residents temporarily moved from 136 council homes, which led to them being empty "for a period of time", its borough council said. Canterbury City Council said its most recent count - not yet published by the government - saw it reduce the number of vacant homes by 26% on its 2016 figure. "We estimate that only 20% of the total are truly empty, when you take out those that are up for sale, being refurbished, in probate or not suitable for residential letting due to their location," a spokesman said. It has an empty homes officer tasked with bringing properties back into use. Runnymede Borough Council said the government's statistics represented a "snapshot" in time and therefore included "blips", adding that long-term empties in the borough had since been reduced to their lowest number there since 2004. In Scotland, 22 out of 32 councils saw a percentage increase in the number of long-term empty homes in 2016, with Aberdeenshire seeing an increase of 20%. Bob Fraser, senior partner at law firm and estate agents Aberdein Considine, said a fall in the price of oil and gas was behind the rise. "The property market follows the fortunes of the oil and gas industry, it always has," Mr Fraser said. "People who would wish to sell properties are unable to sell due to lending, or they can't because of negative equity. Some people opt to leave matters until the property market recovers. "The largest fall of 20% has been the upper end of the market. The market was very buoyant and was one of the most expensive in Scotland and outside the South East." In Northern Ireland, five out of 11 councils saw an increase between 2016 and 2017. Northern Ireland's Land and Property Services was able to provide figures up until 31 March 2017. In Wales, eight out of 22 council areas saw the largest number of vacant homes for six years. A spokesman for the Department for Communities and Local Government responding to the data for England said: "We have given councils powers to bring empty homes back into use, and the number is now at its lowest since records began and has fallen by a third since 2010." For more information on methodology, click here. For the full dataset, click here. Why are so many British homes empty? Stoke and Liverpool £1 homes: Are schemes a success?